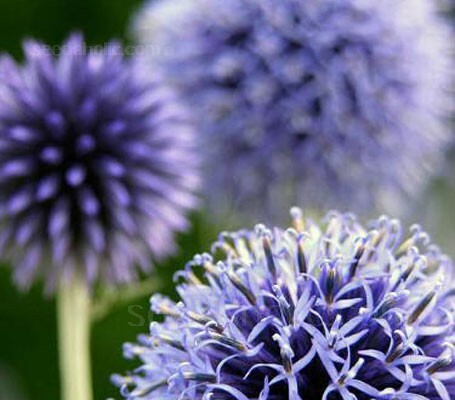 Echinops ritro or 'Globe Thistle' is a hardy perennial and a non demanding plant for the border. This robust, upright herbaceous perennial has jaggedy-divided, prickly dark green leaves which are whitish beneath. One of my favourites for the back row, I love the prickly blue balls in July - they are actually softer than they look. It’s an unusual colour and structure, so a great conversation piece and an excellent cut or dried flower for use in arrangements. In late summer through to autumn, the globular heads of round, violet-blue flower heads appear, each on silvery, branched leafy stems. The handsome spherical buds grow to about the size of a golf ball, they open into flower from the top down. With deeply lobed, dark green foliage, which looks jagged and prickly, but actually the undersides are downy. Atop the stiff, rigid stems the spherical blooms appear, they have a metallic lustre and may be cut for the vase, or dried for winter decoration. The plants begin flowering in July and will repeat flower throughout the season, deadheaded after flowering to encourage a second flush of flowers and extend the season. The plants grow 90 to 120cm (36 to 48in) tall, with a spread of 60cm (24in) and are suitable for the mid to the back of the herbaceous border. Beautiful for mixing with the flowers of high summer, providing not just colour but variation of form. Plants may be trimmed to the ground in late fall, or left for winter interest. 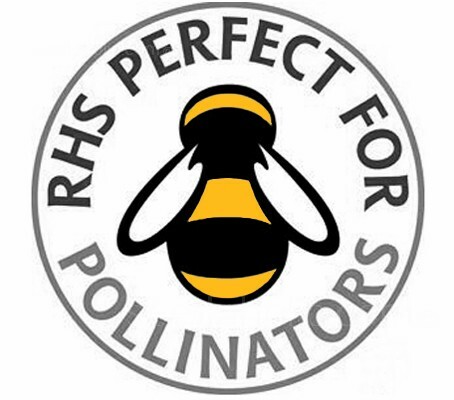 Remarkably low maintenance and hardy, the plants are drought, pest and disease resistant. The flowers will attract many bees and butterflies into the garden. It is interesting to watch the bees on these globe shaped flowers, they will methodically circumnavigate each globe until all available nectar has been harvested. 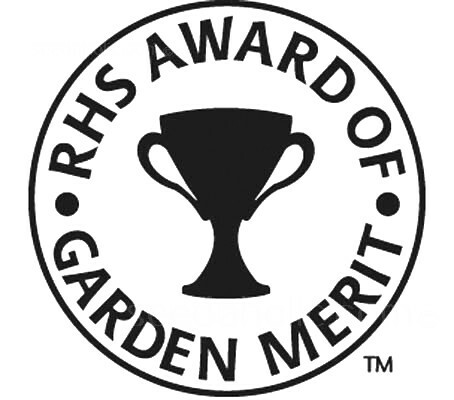 Echinops ritro has been awarded the prestigious RHS Award of Garden Merit (AGM), for plants of outstanding excellence. Sowing: Sow in late winter/late spring or late summer/autumn. When seedlings have their first pair of true leaves and are large enough to handle, transplant into 7.5cm (3in) pots. For autumn sown seedlings, pot on and grow for another year before planting outside permanently. They prefer a position in full sun but can tolerate partial shade. They are easily grown in average, dry to medium, well-drained soils in full sun but will tolerate a wide range of soils, including poor, infertile, dry ones, as long as well-drained. Taller stems may need staking, particularly if grown in rich, fertile soils. Plants can be left undivided for years or divided in autumn or in spring. Cut back the flowering stems as soon as the first lot of flowers fade to encourage a second flush of blooms in early autumn. Lift and divide congested colonies in autumn or spring. Echinops is an excellent cut flower for use in arrangements. They add a unique element and are becoming more popular with florists every year. Because of the strong stems and robust flowers they are also a very popular flower for drying. To dry, simply hang upside down in a warm, dark and dry place. Echinops associates well with other tall striking late summer plants such as cardoon and echinacea or tall miscanthus grasses. Native to southern and eastern Europe, and western Asia, Echinops ritro can be found from Spain east to Turkey, Ukraine, and Belarus. Echinops was introduced to England in 1570 and by the last half of the 1800's the Globe thistle had became a popular Victorian flower. These beautiful perennial globe thistles are in the family Asteraceae (formerly called Compositae). At first glance the relationship between this member of, the more typical sunflower or daisy seems remote, until a closer look reveals the presence of many individual sessile flowers, or florets. The obvious difference being that the capitulum, or flower head is rounded into a globe shape instead of flattened like a plate, as in the sunflower or daisy. Each flower consists of five petals that is fused into a long corolla, the petals open a sky-blue colour, against the deeper ink blue of the stamens, that protrude like a spear from the centre of each flower. Echinops is taken from the Greek echinos, meaning a 'like a hedgehog' (or sea-urchin) describing the circular spiny thistles, and the word opsis which means 'resembling'. The species name ritro means 'of gardens'. The common name of Globe Flower simply refers to the globe shaped flowers. 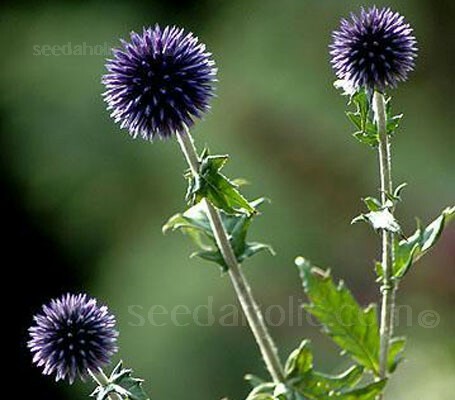 It is often called the Globe Thistle, referring to the spiky balls. Thistle are characterised by leaves with sharp prickles on the margins. Prickles often occur all over the plant, on surfaces such as those of the stem and flat parts of leaves. These are an adaptation that protects the plant against herbivorous animals, discouraging them from feeding on the plant. East, West or South facing. Exposed.